It looks like the Sony Ericsson Xperia PLAY isn’t going to be the dedicated Android gaming device on the block, a company named JingXing has decided to step into that niche with a device of its own: the JingXing S7100. 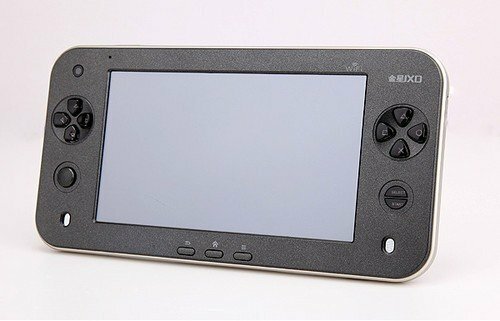 However, the S7100 isn’t a phone and takes the form factor of tablet instead, and features gamepad controls on the sides of the display. While the specs of the device weren’t revealed, it will be running on Android (as evident by the dedicated Android buttons on the bottom of the device and the Android logo on the back), and will feature a rear camera and a front facing camera. The tablet’s gamepad gives users a 4-way D-pad, 4 regular buttons (circle, triangle, square, x), as well as start and select. No sign of shoulder buttons, so I guess you’ll need to use onscreen controls for those. Don’t expect to have a dedicated app store like the Xperia PLAY/PlayStation Vita – but you can be pretty sure that ROM emulators are going to be this tablet’s best friends. No word on pricing or availability, but we’ll keep you posted if it turns up on this side of the world. It’s always interesting to see tablet manufacturers putting their own spin on Android devices – with the plethora of tablets available on the market today, they need to find a way to stand out somehow.